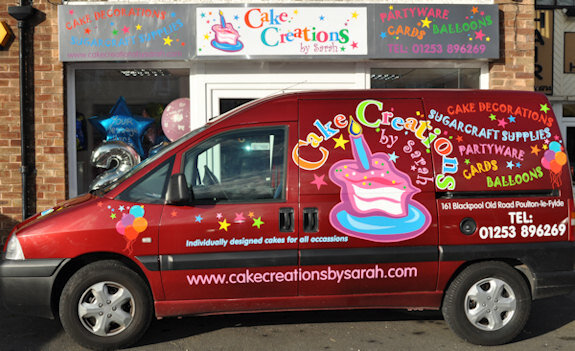 Cake Creations and Float away balloons offer a personal delivery service for all our cakes and balloons. We can deliver your cakes or balloons to any venue and offer a free set up service with all deliveries whenever possible. Prices for delivery is often included in the price of your cake and balloons but local delivery starts from only £2.99. If delivery is required to an area outside Lancashire then this is also possible. If you supply your postcode we can give you an accurate cost of delivery. Personal delivery by ourselves guarantees safe and secure delivery and in plenty of time for your party. We also offer a huge range of cakes and balloons 'By Post'. For this exceptional service we use one of the UKs largest courier companies with guaranteed next day delivery. Take a look in our 'Cakes by Post' section for more details and ideas of cakes you can send as a gift or for that special occasion.